Halogen bulbs get very hot when lit. Oil, perspiration, or a scratch on the glass can cause the bulb to overheat and shatter. The headlight aim is set by the factory, and does not need to be adjusted. However, if you regularly carry heavy items in the cargo area, have the aiming readjusted at a dealer or by a qualified technician. The HB2 type is halogen bulb. When replacing a bulb, handle it by its base, and protect the glass from contact with your skin or hard objects. If you touch the glass, clean it with denatured alcohol and a clean cloth. The exterior lights’ inside lenses (headlights, brake lamps, etc.) may fog temporarily after a vehicle wash or while driving in the rain. This does not impact the exterior light function. However, if you see a large amount of water or ice accumulated inside the lenses, have your vehicle inspected by a dealer. 2. 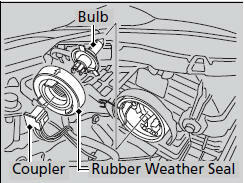 Remove the rubber weather seal. 3. 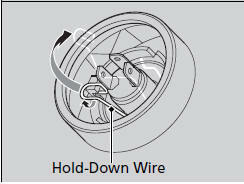 Remove the hold-down wire, then remove the bulb. 4. Insert a new bulb. 5. Reinstall the hold-down wire. Hook the end of the wire on the knob in the slot. 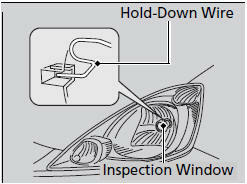 ► You can see if the hold-down wire is in the right place from the inspection window. 6. Reinstall the rubber weather seal. 7. Insert the coupler into the connector of the bulb.